Before final art is sent away to be professionally printed, there are certain steps that must be taken. It is important to follow these carefully and double check everything. If not, you risk having it come back from the printer with a request to do it properly, or worse still, receiving an imperfect final product. DO proof-read everything carefully. Check the spelling, punctuation and layout. Have someone else look it over. Sometimes having worked for a long period on a layout, we can become blind to the little errors in the document. DO make sure that you either outline your fonts (Adobe Illustrator) or provide the fonts you used in your design in a ‘fonts’ folder inside your main project folder. DO make sure that all your images are where you want them to be. DO make sure that all your images are 300 DPI and CMYK. DO make sure that all you either embed images in the artwork or collect them together in an ‘image’ folder inside the project folder. DO put a 3 mm bleed extending from the trim mark (parameter) of the artwork. DO put crop marks to indicate the trim marks. DO group all your artwork together and then lock it so that it cannot be accidentally distorted at the printer. DO get whoever is in charge of the project to sign off on the artwork saying that they have read and approved it. This is a very important step in protecting yourself if something goes wrong in the final product. Spelling mistakes can be common and you don’t want to get the blame for having missed it. Remember, designing and content development/editing are separate tasks. DO save your final document either as an EPS file or PDF file. If you are saving as a PDF file, you don’t have to outline your fonts. It is the preferred file format of most printers. It is suggested that you ask your printer beforehand what file format they would like your files to be. If you are using Adobe®InDesign®, you can send the document as a .INDD file. DO collect all documents related to the project in one folder and title them clearly. 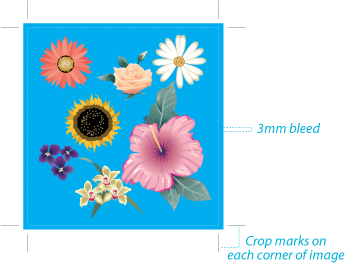 DO a colour print and/or colour mock up of the artwork to act as a reference guide for the printshop. Give this to the printer along with a cover letter specifying any special instructions for the project as well as your contact details should they have any questions. DON’T try to email a folder to the print shop. Ask them what their preference is and send the artwork to them accordingly. Most printers will have an FTP (File Transfer Protocol) server that you can upload the artwork to. You could also burn everything onto a CD and mail or deliver it. DON’T be shy about asking questions. The print shop is there to help you. If you are new to this process, there is a learning curve so don’t be intimidated. If you are unclear about something, always ask. If something is important, get your response in writing. Emails are a great way to document important communications. DO ask if you can monitor the print process and see some examples before the whole print run has been completed. This is effective quality control.